Unbelievable Vegan Chicken Parmesan made from chickpeas! A crispy, saucy, cheezy, delicious plant-based dinner recipe your whole family will enjoy! Friends, I can’t believe I’m saying this. My first cookbook, 30 Minute Vegan Dinners, will be out in less than a week! What an incredible journey this has been. I want to thank each and every one of you! Thank you for enjoying my content and recipes. Thank you for making and sharing them. Thank you for reading this right now! My dreams are coming true because of you and I’m soooooooo happy and grateful! It has been a whirlwind of planning the launch party, working from home with my daughter, and creating new content for y’all to enjoy, but I’m committed to sharing the kind of recipes that helped me get a book deal in the first place! Super kickass vegan dinners that are easy and quick to make, and taste better than their non-vegan counterparts. So, allow me to present this Vegan Chickpea Parmesan! It’s made with simple ingredients and takes just 45 minutes to make. Easy peasy and perfect for any night of the week! This vegan chicken parmesan starts with a can of chickpeas. Add a few spices, breadcrumbs, and gluten flour, and BAM! You’ve got vegan chickpea parmesan!! The recipe is based on my Crispy Buffalo Chickpea Sandwiches and it is fabulous! When you make this Vegan Chickpea Parmesan, be sure to let me know how it turned out in the comments! While you’re at it, post a photo to Instagram with the tag #carrotsandflowers so I can admire your creations! It makes me so happy to see y’all make my recipes. Thank you for welcoming them into your kitchen! Thank you again so much for supporting my blog and small business! It means the world to me to be able to create and share these recipes with you! If you have any questions, comments, or need help going plant-based, feel free to leave a comment below! Crispy, amazing Vegan Chick'n Parmesan with made-from-scratch vegan chickpea patties. Delicious, hearty, nourishing, and ready in 45 minutes! Preheat the oven to 375 F. Drain and rinse the chickpeas, reserving the liquid (aquafaba) in a shallow bowl. Mash the chickpeas with 2 Tbsp olive oil until no whole chickpeas are left, but still leaving some chunky pieces. Add the bread crumbs, bouillon, Italian seasoning, garlic powder, sea salt, tamari, water, and lemon juice. Mix with a fork or your hands until just combined. Sprinkle in the gluten. Knead the dough with your hands until gluten strings form, about 2-3 minutes. Add more gluten 1 Tbsp at a time if the dough feels too wet and sticky. Add a small amount of water or olive oil if it's seems dry. Put a large cast iron skillet over medium heat. Form the dough into patties using small handfuls of dough. Press the patty into a shape slightly larger than the size of your palm, about ½" thick. In a shallow bowl, whisk together the breadcrumbs, cornstarch, and salt. Pour enough olive oil to cover the bottom of the skillet, about ⅓ cup depending on the size of your skillet. Working quickly so the oil doesn't burn, coat the chickpea patties in the aquafaba, then dip them into the breadcrumb mixture. To keep your fingers from becoming too sticky, use a fork to transfer the patty from the aquafaba to the breadcrumbs, then use a dry hand to sprinkle breadcrumbs and coat the patty. Transfer the battered chickpea patties to the skillet with a fork. Pan fry each patty until golden brown, about 2 minutes on both sides. Place the skillet into the oven (this only works with cast iron) and bake for 25 minutes. Flip halfway. 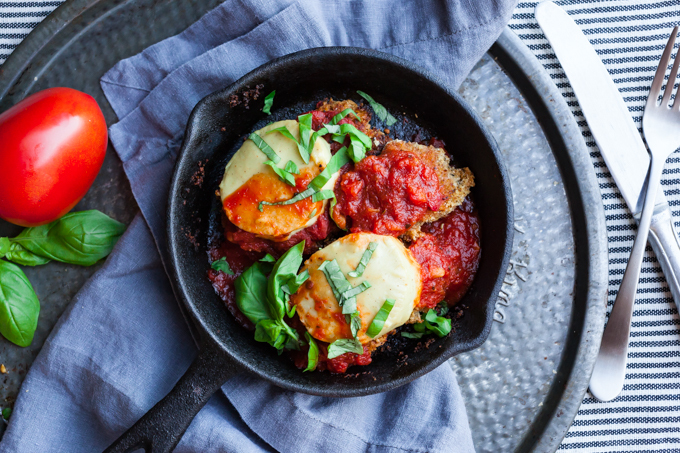 When the chickpea cutlets have about 10 minutes left, pour the marinara over the cutlets then add the mozzarella and finish baking. Serve over a bed of pasta with extra marinara or with a simple side salad. Enjoy! You can skip the frying step and simply bake the chickpea cutlets. Add an extra 5 minutes to bake time if you choose this step. If you're not using a cast iron pan, transfer the pan-fried cutlets to a baking sheet before baking. I love using homemade cashew mozzarella for this recipe, but any vegan mozzarella will taste great! Can I use panko breadcrumbs with Italian seasoning for Italian breadcrumbs? I really want to make this! What can I substitute for the gluten?